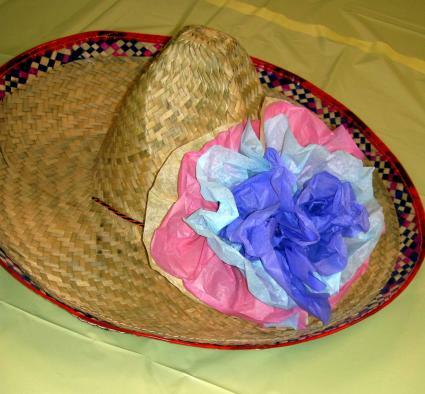 Decorate a sombrero with colorful tissue flowers for Cinco de Mayo. Cinco de Mayo, Mexico's annual celebration of its victory over the French Army in 1862, is the perfect time to make festive decorations with tissue paper flowers. Mexicans adorn their hats, schools, party venues, piñatas, and even parade floats with these fun and easy-to-make flowers. You can use any bright colors or alternate red, white, and green to symbolize Mexico's flag. Red, yellow, and green gift wrap tissue paper, two or three sheets per flower. If your children are young or if you are in a hurry, simply take two or three sheets of tissue from a package of paper. Place the sheets in a stack and rotate the top sheets so that their corners do not directly overlap each other. This will make your final product look more like flowers and less like paper. Find the center of your papers by gently folding them in half without creasing along the fold lines too much, then gather the center into a bunch with your hands. Leaving at least two inches of tightly gathered paper as a base for each flower, wrap the top of this base tightly by twisting a pipe cleaner around the top of each base. Adjust the flowers folds to suit your taste. With the pipe cleaner “stems,” you can arrange your flowers into bouquets and twist their stems together. For flowers that you will attach to Cinco de Mayo floats or piñatas, you can place a dot of hot glue in the center of each layer of tissue paper before gathering and twisting, then glue to your float or piñata surface. You may want your Cinco de Mayo tissue flowers to look more realistic to decorate your fiesta hall or restaurant. In that case, you can either use crepe paper streamers, which will make smaller flowers, or you can use tissue paper. Regular gift wrap tissue paper will not hold its shape at the edges of your flowers as well as crepe paper will, but the results will still be attractive. For more realistic flowers, trace around a small bowl onto your tissue paper or crepe streamers. You may need to use a cup or glass if your streamers are narrow. Cut at least eight circles for each flower. For each flower, fold one tissue paper circle in half. Wrap this circle loosely around your pencil, then slide it off the pencil and pinch it at the bottom. Set it aside. Gently fold and press one edge of a circle around a pencil, then slide the pencil out of the rounded edge. Repeat six more times for each flower. This will create the appearance of softly opening rose petals. Set the petals aside in sets of seven or more. Taking another circle in hand, align the bottom edge with the first circle and gather the bottom around the base of that folded circle. Continue to hold this base between your thumb and forefinger and repeat the process with a third circle until you are satisfied that you have enough petals on your flower. Then wrap the entire base with a pipe cleaner. Twist the pipe cleaner tightly to secure the base. Tissue paper colors bleed and run when wet. Cover your work surface with a plastic tarp or tablecloth, and ask your kids to keep the tissue paper on the work surface and wipe or wash their hands before touching anything not related to the craft. Otherwise, your favorite chair may turn green or red. The ends of pipe cleaner wires can be sharp, so help your younger children use theirs. Always supervise kids when they are crafting. You can use these flowers individually or place into bouquets. If you don’t mind a mess, take your flowers outdoors or in a well-ventilated area and spray them with glitter, but hold the can at least ten inches from the paper and spray lightly. You can repeat this process after the first coat dries. This will help prevent the color from running and dripping. Spray them with cologne; your children will enjoy making their flowers smell real. You may have so much fun making these that you'll want to use your leftovers for more tissue paper crafts.